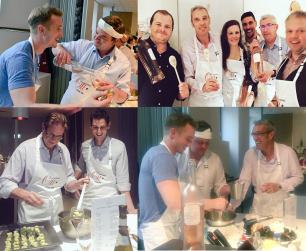 On Wednesday 10th May a lucky few, comprising of members of the wine trade, press and MMD staff, cooked up a storm at Aveqia London at Maisons Marques et Domaines’ second Domaines Ott Cook Ott* event to celebrate the launch of the 2016 vintage By Ott and Clos Mireille Rosés. The evening began with a toast by Christophe Renard of Domaines Ott*, who talked the guests through the history of the winery, as well as the new vintage releases, while they enjoyed a glass of By Ott. As the name suggests, the evening revolved around guests competing for the title of Cook Ott* Champion, battling their way through a series of intricate courses devised by Aveqia’s top Chefs. The menu had Provence at its heart, with each dish glorifying a typically Provençal ingredient to complement Domaines Ott’s quintessentially Provençal wines. Team Entrée prepared an Asparagus and Goat Cheese Beignet to match the Domaines Ott Blanc de Blancs, a blend of and Sémillon, Rolle and Vermentino, which balanced the richness of the goat cheese and beautifully complemented the verdant flavour of the Provençal asparagus. The Fish Course was a classic Provençal dish of Red Mullet Bouillabaisse with Aioli and Basil Oil to complement Domaines Ott’s Grand Vin, the Clos Mireille Rosé 2016. The savoury fish broth enhanced the delicate redcurrant, candied melon and peach flavours of the wine, while the Rosé’s freshness cut through the richness of the garlic mayonnaise. Two teams worked together to tackle the main course of Lamb Rump, Provencal Vegetables, Olive Tapenade, Persillade and Lamb Jus, designed to match the Domaines Ott* Bandol Rouge. The dish balanced Provençal rusticity with fine dining, making it the perfect partner to the silky tannins, pepper spice, thyme and ripe black fruit notes in the Mourvèdre led Bandol Rouge. The meal concluded with a Lemon Panacotta, Peach Compote, Caramelised Peach, Lavender Ice-Cream and Sabl Biscuit. The dish, designed to celebrate Provence’s most famous flower, was paired with the Ramos Pinto White Reserva Port. Ramos Pinto, like Domaines Ott, is a member of the Louis Roederer family, making it a fitting complement to this stupendous dessert. After tucking into a fabulous meal of their own making, guests anonymously voted for their favourite course, ultimately crowning the Goat Cheese and Asparagus Entrée and Domaines Ott* Blanc de Blancs as the winning pairing. This victory for the Blanc de Blancs should come as no surprise given that, although Domaines Ott* is often considered to be synonymous with Rosé, it is a winery that achieves excellence and quality across its award winning range.